It is not for the Chief Ombudsman to tell anyone to be polite and humble when asking for information. It is most certainly not for her to suggest that officials can obstruct information – because that is all that being “gun-shy” can mean here – when they are irritated. By coincidence, I had received a few days earlier (finally!) the Chief Ombudsman’s decision on our complaint against NIWA. She turns us down. NIWA wins. NIWA refuses to tell us what really went on when the Australian Bureau of Meteorology peer-reviewed NIWA’s reconstruction of New Zealand’s temperature records in 2010. Reading Dame Beverley’s decision, the Dom Post theme emerges again, of the Chief Ombudsman helping public agencies elude restraint. It seems our Chief Ombudsman lacks the will to implement the legal requirement of her office to challenge powerful government agencies when they disadvantage private citizens. She denies our right to understand and verify the country’s temperature record and instead affirms NIWA’s right to keep their methods and their crony science secret. Curiously, the Ombudsman’s office has asked us “to refrain from publishing the opinion, or referring publicly to its contents,” before publication of an anonymised version of it on the Ombudsman’s website. But I’m doing so now because there’s no legal backing for interim secrecy and because there’s still considerable public interest in the matter, even after four years of waiting. But what is NIWA hiding? In submissions to the Ombudsman dated 17 May 2011, NIWA, inter alia, stressed how much information it publishes concerning climate issues, including the Seven-Station Series (7SS) national temperature record. NIWA is a very open organisation. It already makes its raw and adjusted temperature data available to the public through its climate database, which is accessible via its website (http://cliflo.niwa.co.nz). In addition NIWA widely and publically [sic] publishes its research findings both in peer reviewed and general publications, through its various reports and public presentations and by direct interaction with the public and end users of its research. It has a keen interest in disseminating its research findings as widely as possible so that the public are aware of climate change issues. In relation to Mr Treadgold’s request, NIWA made the final peer reviewed station reviews, along with a confirmation from BoM that it had undertaken an independent peer review, available to the public. In addition, the original station reports and data used in the reviews were made freely available to the public. Those activities and dissemination channels mean that NIWA’s research, the data it analyses to develop research results, its methodologies and various analyses are widely available. This allows other researchers (and the public) if they so wish, to reproduce and verify or otherwise, NIWA’s research, results and conclusions. This allows members of the public to assess the veracity and validity of NIWA’s research and verify the scientific basis upon which policy decisions are made by the Crown and territorial authorities. To this extent NIWA contributes to the development and administration of policies and laws and assists the public to participate in that process. Accordingly, it seems clear that NIWA’s information and views concerning climate issues are not hidden from public view. On the contrary, they are widely disseminated. But they haven’t released the information we’re after. NIWA freely publishes so much material (apparently) that one wonders how any could be left. We ought to be satisfied. Why do we persist with our troublesome demands for more? For all the lack of sympathy she demonstrates for citizens battling bureaucrats, there’s no suggestion that our retiring Ombudsman actually misleads anybody, but NIWA certainly does mislead us. They have a track record. They misled us in the beginning by claiming the methodology they used for their adjustments had been published in certain places when it had not been. NIWA has deceived the Ombudsman over the meaning of peer review, they promised the Parliament they would publish their most recent methodology in a peer-reviewed journal but have done nothing about it, they deceived their minister and the Parliament over their methodology for adjusting temperature readings, and no doubt reckon that deceiving a cheerfully compliant Ombudsman will scarcely be noticed. Why have they battled for four years to keep it secret? There was never an agreement with the BoM for confidentiality (the BoM was ready to give us the documents we wanted and even helpfully described them all — but NIWA refused to allow the release). Why aren’t they honest? Why don’t they tell their employers (us) the truth and openly (like proper scientists) describe the peer review? Apparently Christchurch City Council are going to get Tonkin and Taylor “peer reviewed” again. Any bets they chose NIWA? I bet they don’t choose Willem de Lange. Though they should. Chief Ombudsman? Chief Gatekeeper more like. Doesn’t allow it for the 7SS. We know that NIWA’s 7SS is not formally documented so researchers have to follow an arbitrary interpretation of a method i.e. make it up as you go along. When the method they purport to use is followed to the letter, the 7SS is not verified i.e. “or otherwise” as NIWA state. At least NIWA allows this. NIWA effectively concedes, in respect to the 7SS at least given the evidence, that the dissemination of information they provide and the use of it does not necessarily verify their analysis. Wrong, NIWA would have been right if they had inserted “or otherwise” again. NIWA have a prediction page on their website. The “scientific basis” of their atmospheric temperature prediction is IPCC radiative forcing methodology. The temperature prediction is being proved false every month by the recent observed temperatures which include NIWA’a own datasets (7SS, 11SS, VCS) and corroborating data such as BEST NZ. Might “seem clear” to Wakem and she is probably correct on most “climate issues”. By was the request in respect to general “climate issues”? No. This is a very specific issue that Wakem either hasn’t got to grips or doesn’t want to, or is just playing gatekeeper, or both. BEST NZ monthly trend from 1970 to 2013, corroborated by NIWA’s VCS, is 0.07 C/decade with no recent departure evident. NIWA’s prediction is for 0.18 C/decade from the 1990 base. NIWA’s atmospheric temperature prediction is currently running 2 1/2 times greater than that observed. How does this verify, as NIWA put it, “the scientific basis upon which policy decisions are made by the Crown and territorial authorities” in respect to temperature? Similarly for sea level rise. Figure 2. The annual average global surface temperatures from 108 individual CMIP5 climate model runs forced with historical (+ RCP4.5 since 2006) forcings were obtained from the KNMI Climate Explorer website. Linear trends were computed through the global temperatures from each run, ending in 2015 and beginning each year from 1951 through 2006. 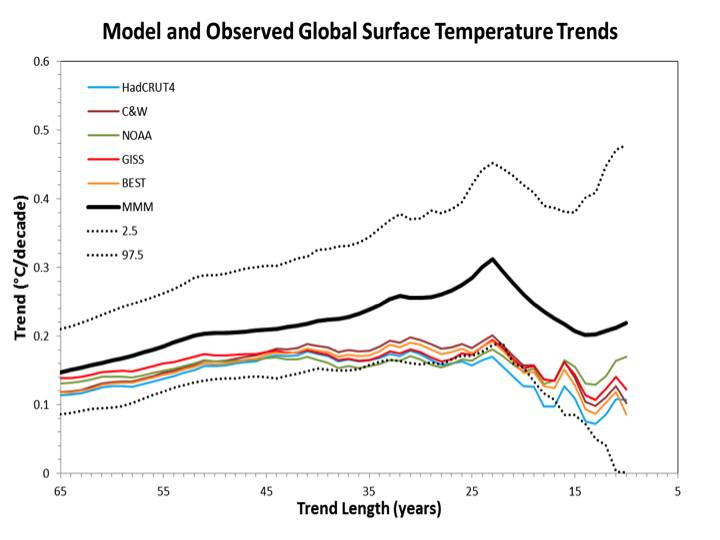 The trends for each period (ranging in length from 10 to 65 years) were averaged across all model runs (black line). The range containing 95 percent (dotted black lines) of trends from the 108 model runs is indicated. The observed linear trends for the same periods were calculated from the annual average global surface temperature record compiled by several different agencies described in the legend (colored lines) (the value for 2015 was estimated from January through October, average). During all periods from 10 years (2006-2015) to 65 (1951-2015) years in length, the observed temperature trend lies in the lower half of the collection of climate model simulations, and for several periods it lies very close (or even below) the 2.5th percentile of all the model runs. Over shorter periods, such as the last two decades, a plethora of mechanisms have been put forth to explain the observed/modeled divergence, but none do so completely and many of the explanations are inconsistent with each other. This is a devastating indictment of climate model performance. For periods of time longer than about 20 years, the observed trends from all data sources fall beneath the lower bound which contains 95 percent of all model trends and in the majority of cases, falls beneath even the absolute smallest trend found in any of the 102 climate model runs. 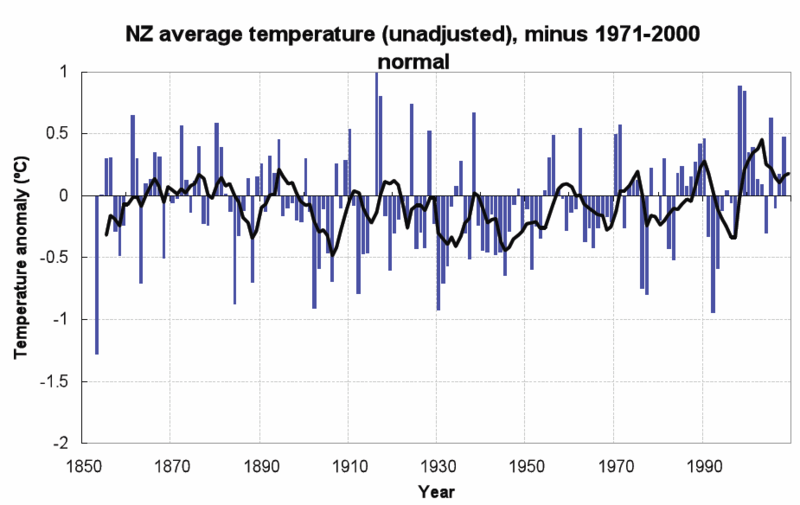 This is the state of the science from which NIWA derive their NZ climate predictions. How does this verify, as NIWA put it, “the scientific basis upon which policy decisions are made by the Crown and territorial authorities” in respect to temperature? Dame Beverley Wakem wouldn’t have the foggiest clue about the state of climate science,the absurdities that it is throwing up, and the questions that should be asked and answered by NIWA in respect to NZ climate. Turning down NZCSC on the 7SS is an easy out, but the truth about various desperate “adjustments” to data cannot be covered up indefinitely when the overwhelming evidence keeps piling up against the “scientific basis” such that even with shonky adjustments in some datasets, the adjusted observation data is not verifying the theory of man-made climate change. The NZ Youth Delegation kindly flew all the way to Paris to make a nice song about reducing carbon dioxide emissions. I would like to thank the SJWs and Desmogblog for drawing this event to my attention. The Northern Hemisphere/Arctic warmth of the 1930’s and 1940’s needed to disappear, because it wrecked the global warming scam. So Tom Karl of NOAA and Gavin Schmidt of NASA simply altered the data to make the warmth disappear. The graph below shows how they rewrote the temperature history at Reykjavik, Iceland between 2012 and 2015. Here are the original Icelandic records showing the first three months of 1940 – Temperatures averaged 1.6C, 1.7C and -0.2C respectively. Tom and Gavin needed to get rid of that warmth, so they subtracted 3.2 C from the measured temperatures for all three months. Iceland’s Chief Meteorologist said there was no reason for the adjustment to the Reykjavik series. Queried GISS, got no answer. 3.2 C is a humongous adjustment. Can’t think how many carbon credits it will take to offset all that warming. And disappear it did. However, in the adjusted Reykjavik series (see upthread), even 2000s raw temperature has been adjusted down by about 1 C leaving only the most recent profile high and dry. The 2008 Reykjavik record occurs in the observed data, NOT an adjusted series. “Warmest ever” records for specific locations are NEVER quoted from adjusted data, it is only nationally averaged or globally averaged and adjusted series (e.g. GISTEMP) where the much touted “warmest ever” records are broadcast. In your face, Tom and Gavin. Christchurch has recorded its hottest December day on record, prompting firefighters to warn people to use “common sense” as the South Island continues to heat up. The temperature in the city peaked at 36.1 degrees Celsius about 4pm yesterday, breaking the previous December record of 35.4C, set in 1975. Monday’s high ranked as the hottest December day for the city on record, with the temperature peaking at 36.1C about 4pm. The hottest temperature previously recorded in Christchurch for December was 35.4C in 1975, followed by 33.5C in 1994, according to MetService. Christchurch’s hottest ever day was 40C in February 1973. The mercury soared past the 30C mark for several South Island centres. MetService said Oamaru also reached a new record for December, peaking at 31.9C, while Timaru equalled its old record of 34.1C. Ashburton was close to its hottest December temperature, reaching 35.3C at 2pm. The town’s record for December was 36.3C, recorded in 1971. Blue Skies Weather and Climate forecaster Tony Trewinnard said Christchurch was “probably simultaneously” both the warmest and coldest place in New Zealand on Monday afternoon. “Depending on whether you were at the airport or at the beach.” The temperature at Christchurch Airport was the third warmest on record [since 1953], beaten only by 40C day in February 1973, and another February day in 1982. In New Brighton, the temperature was only 18C, Trewinnard said. MetService meteorologist Tom Adams said the scorching conditions were due to a warm air mass moving from northern Australia. If say, all these “warmest ever” records were represented by the adjusted NIWA 7SS location series (they’re not, Lincoln represents Canterbury), ONLY the records occurring in the latest unadjusted data (e.g. last “open” site) could be found in the series i.e. identical values. Earlier “warmest ever” records (e.g. Christchurch Airport [since 1953], 40C day in February 1973) could NOT possibly be found in a 7SS-equivalent location series (or GISTEMP) because the raw data is erased in the adjusted series going back in time and in most instances will be cooler after adjustment and coolest the furthest back in time. But the early “warmest ever” records remain in the RAW data, they are NOT erased. These are the records that are quoted. Thus “warmest ever” records other than from large-scale regionally or globally averaged series become somewhat problematic for warmies like Tom Karl and Gavin Schmidt..
Gee, “warmest ever” in February 1973, according to NIWA. Not in their 7SS it isn’t. Clearly, 1916 was the “warmest ever” year in that series. The record remains in the RAW data. NIWA accused of doing “bad science” by Blue Skies weather forecaster. Why ignore Christchurch Botanic Garden readings? I think this is just a wee storm in a Stevenson Screen, Maggy. NIWA produced the Botanic Gardens data on request, as reported in Stuff the day before the story you cite, so there’s no cover-up happening. Perhaps the only thing going on is a bit of extra earnestness from that dynamic private-sector weather man, Tony Trewinnard, of Blue Skies Weather? But, as always, thanks for the link!